Time to venture into new lands filled with riches as you discover new territories in the Age of Discovery slot by Microgaming. The slot has got 5 reels and 25 paylines with players getting a glimpse of potential dangers in the sea. Not to worry, your bravery will be well compensated with chances to win multipliers and some pretty decent riches on board. There’s also wild symbols and special bonuses on offer. Microgaming is one of the most well-known casino software companies. It was established in 1994 back when the online betting revolution hadn’t even begun. Today they are some of the pioneers of the industry with a total of more than 600 games. They are famous for having paid out the largest amounts of progressive jackpots. The company is also known for their unique table games. They offer Keno, sic bo, roulette, poker and more. Their slots cover almost 300 out of the 600 games total. The Age of Discovery ran between the 15th to 18th century. This was when great European nations decided to set sail on unexplored lands all over the globe. The most famous expedition of all would have to be Christopher Columbus’ “discovery” of the Americas in 1492. The game has a good appealing bright and colourful design featuring 2D cartoon-like illustrations. The Age of Discovery meant the welcoming of new exotic foods like pomegranates, papayas avocados, bananas and mangoes which have all been represented in this slot. Other symbols include; the Santa Maria ship, coat of arms, Holy Red Cross, Columbus' sailing vessel, navigational devices and special symbols like the golden coin wild and hand drawn serpent scatter. Scatter symbol- The sea-serpent symbol awards multipliers from 5x, 20x all the way to 80x. Treasure hunt bonus- If you land 3 or more compass symbols on the reels, you’ll be able to steer your way to a bonus side game. The treasure hunt feature indicates a map of islands with an “X” mark on them. All that you’ll need to do is choose which of the treasure spots to start off your hunt and win random cash rewards on. If you land any skull and bones symbols, this brings the game to an end and you’ll have to go back to the safety of the ship. 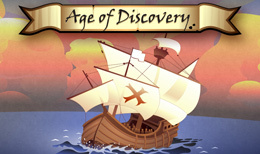 Age of Discovery captures the heart of exploration with a bright and bold screen plus a bountiful treasure hunt bonus game. It’s 2D design won’t really blow you away, but it is definitely worth checking out if you want to read up on a historical adventure and also rack up some decent wins.